Learn how to add messages to your split tests. After you have selected what you'd like to split test, you must add content to your automated split test. If you have opted to split test Message Content you will have to repeat these steps for each of the split test groups. For this example, the below is split testing Subject Line. 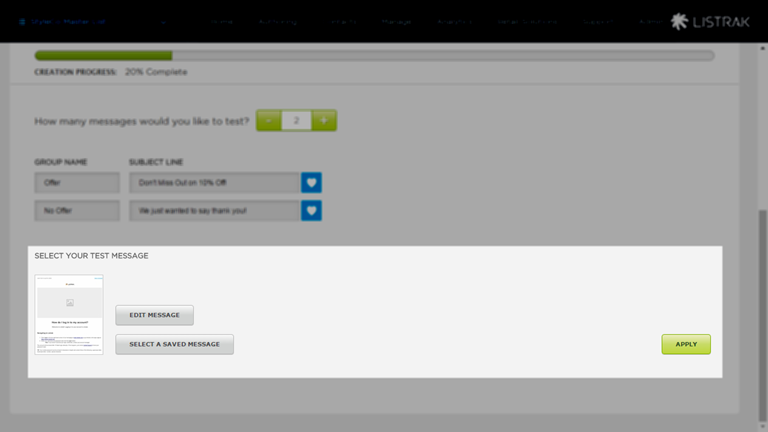 When adding messages to your split test, you have two options. You can either Create New Message or Select A Saved Message. If you have your message content externally or still need to build your message, click Create New Message. If you have your message set up in Listrak already and saved under Saved Messages, click Select A Saved Message. Which would you prefer to do? Click either of the below options to proceed. Fill out the details on the message you'd like to create. When you have created your message and are satisfied with its contents, scroll to the bottom of the Edit Split Test Message screen. You will be taken to a confirmation screen to confirm your settings on the message. Click Commit Message To Split Test. After you have committed your message, you should see an icon preview of the message you committed to the split test. If you are split testing Message Content repeat this for each message you would like to test. 7. Click Apply to move to the next step. Click on Select a Saved Message. This will take you to the Saved Messages screen. Select the message you'd like to commit to the split test. On the Edit Split Test Message screen, scroll to the bottom.